Almost every hour, someone in our community is diagnosed with cancer. These are our friends, neighbours and family members, and we want to make sure they receive the best cancer care and treatment right here at home. The Ottawa Regional Cancer Foundation is exclusively dedicated to improving and saving the lives of people touched by cancer in our community. 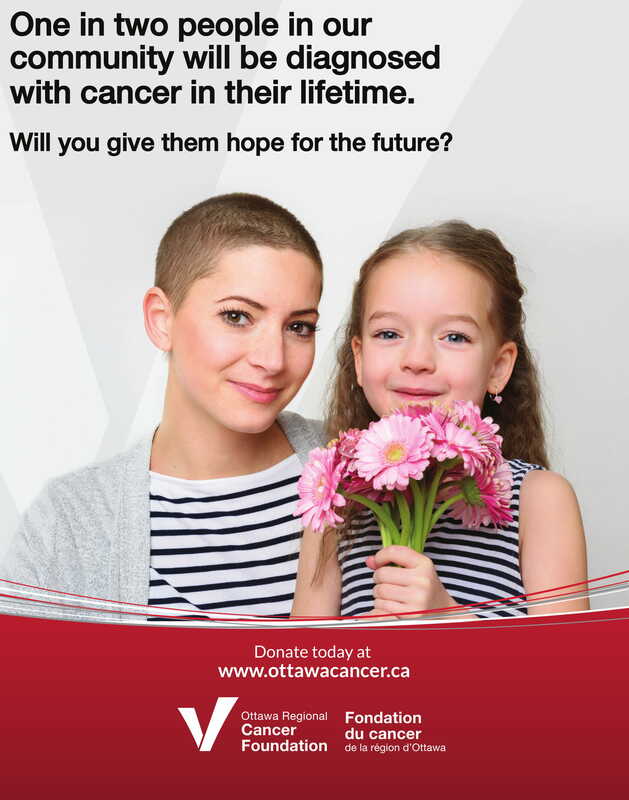 We are constantly supporting advances in local cancer care, research, and clinical trials to change the lives of families facing cancer in the Ottawa region. Geographic region of focus: Eastern Ontario with every dollar raised staying in our community. 100 per cent of money raised in this community stays in this community. When you donate to the Ottawa Regional Cancer Foundation, you are putting your trust in us, and we take that responsibility seriously. We are committed to the most important issues in the field of cancer care and will always direct funds to the areas where they will have the greatest impact for families facing cancer in our region. Giving to Cancer Coaching improves lives: More than 7,000 visits to the Cancer Foundation to occur each year, where cancer patients and their families are able to receive the guidance, tools, resources and support they need to better manage the stress and challenges associated with a cancer diagnosis. Ramona is here today because of a clinical trial. Giving to clinical trials saves lives. Clinical trials not only help researchers better understand cancer and the many approaches to treating it, they help to save lives. The Cancer Foundation has supported every single clinical trial opened in Ottawa for the past eight years, ensuring our community has access to the newest and best treatment options right here at home. Giving to local research gives hope: Helping local scientists bring their discoveries from bench to bedside helps patients get the treatment they need sooner. A strong community of scientists and the funding of local fellowship programs brings some of the world’s best researchers here to our community. Cancer Champions Breakfast: Over 500 business leaders gather at one of Ottawa’s most anticipated networking and social events. Join Ottawa’s elite and become a table captain. Monthly giving: For just $83.33/month, you can give the gift of Cancer Coaching to a family throughout their entire experience with Cancer. The Ottawa Regional Cancer Foundation funded Dr. John Sinclair's first-in-Canada approach to brain cancer surgery. Estate planning: What do you want your legacy to be? We will work with you to create a plan that is meaningful to you. Corporate giving: Set up a payroll deduction campaign at your business or sign up a corporate team for Crush it for Cancer (March 30th). Retired, past-president and CEO of MDS Aero Support Corp.